Adobo is an all time Filipino favourite. Every family makes it differently; some make it with eggs, some make it with a lot of sauce. We like it sans eggs, and with just enough sauce that it’s almost dry. There’s no right or wrong way to do it, so don’t be afraid to experiment once in a while until you get it just how you like it. The thing about eating Filipino food is that it’s rice intensive. Adobo is no exception. It’s always a good idea to make enough for everyone, but with Adobo, there’s usually some leftovers. Not because it’s not a best seller (it always is, no matter how you make it). It’s just that like a fine wine, Adobo just gets better over time. So, what to do with leftover Adobo? 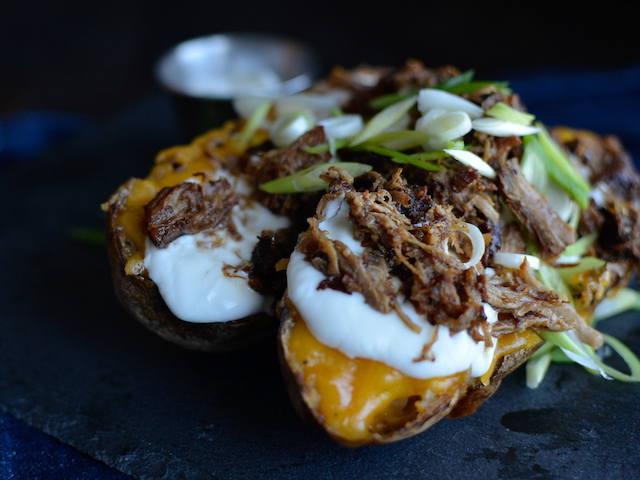 Here’s something you might want to try: Baked Potatoes with Adobo Flakes. It’s not the first thing you’d think of when pairing adobo with something else (rice, is actually the only thing that comes to mind, and loads of it), but amazingly, it makes for great comfort food (you know, because of all that melted cheese and sour cream). If you haven’t already, why don’t you check our my awesome Pork Belly Adobo recipe here for a little bit of inspiration. Shred the left over pork adobo with a fork. In a pan, heat the canola oil, then add the shredded pork adobo until it becomes crisp.